The interpretation and communication of fire danger warning levels based on fire weather index values are critical for fire management activities. A number of different indices have been developed for various environmental conditions, and many of them are currently applied in operational warning systems. To select an appropriate combination of such indices to work in different ecoregions in mountainous, hilly and flat terrain is challenging. This study analyses the performance of a total of 22 fire weather indices and two raw meteorological variables to predict wildfire occurrence for different ecological regions of Austria with respect to the different characteristics in climate and fire regimes. A median-based linear model was built based on percentile results on fire days and non-fire days to get quantifiable measures of index performance using slope and intercept of an index on fire days. We highlight the finding that one single index is not optimal for all Austrian regions in both summer and winter fire seasons. The summer season (May–November) shows that the Canadian build-up index, the Keetch Byram Drought Index and the mean daily temperature have the best performance; in the winter season (December–April), the M68dwd is the best performing index. It is shown that the index performance on fire days where larger fires appeared is better and that the uncertainties related to the location of the meteorological station can influence the overall results. A proposal for the selection of the best performing fire weather indices for each Austrian ecoregion is made. Forest management agencies, fire fighting services and meteorologists are often confronted with the task of predicting probabilities of wildfire occurrences. Under uncertain meteorological conditions, decision makers are interested in having a reliable method of predicting the relative probability of a forest fire. Besides the importance of socio-economic factors, the ignition of forest fires is a result of complex interactions between ecological factors such as weather, fuel type, forest structure and topography (Schumacher and Bugmann 2006). The probability of ignition is linked to the dryness of the vegetation which is directly related to weather variables (Reinhard et al. 2005). For several decades, fire weather indices have been used all over the world as proxies to estimate the dryness of the vegetation (Thornwaite 1948, Nesterov 1949, Käse 1969). They are used in many different countries and exist in a large variety. Some include very simple algorithms combining temperature and humidity (i.e. Sharples et al. 2009a,b), while others are sophisticated tools, which can be used to estimate not only the probability of a fire but also the rate of spread and fire severity (Van Wagner and Picket 1985, Willis et al. 2001). To identify an appropriate fire weather index for the differing national and regional contexts in mountainous, hilly or flat terrains is therefore challenging. In the temperate mountain forests of Central Europe, forest fires have only played a minor role to date, although, at local scales, alpine forest fires can have serious consequences for the protective function of forests (Brang et al. 2006). European mountain regions may experience somewhat higher increases in future temperature compared to non-mountainous regions (Reineking et al. 2010; Auer et al. 2007), and the forested regions of Austria have already seen a rise in mean temperature of 1.5 °C in the past half century (Eastaugh et al. 2010). Under climate change, countries that have been known for their low impact fire regimes concerning fire frequency and burned area seem to be facing an increasing probability of wildfires (Wastl et al. 2012). Therefore, those countries need to check and adjust existing fire warning systems with more caution than in the past (Flannigan et al. 2000). Although Austria is situated in the moderate Central European climatic zone, there is high ecosystem variety according to topographic factors, ranging from colline to alpine altitudinal zones and comprising also a more continental climate in the eastern part and the eastern foothills of the Alps. This heterogeneity in climatic and ecological conditions calls for a solid and careful choice of a Fire weather index. The current fire warning system operated by the Central Institute for Meteorology and Geodynamics (ZAMG) uses the Nesterov Index (Nesterov 1949). However, a systematic comparison of the performance of fire indices for Austria is still lacking. 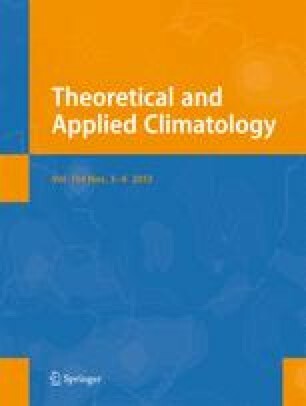 This study therefore analyses the performance of a total of 22 fire weather indices and 2 climatic variables for different ecoregions of Austria. We demonstrate a method to select indices for different regions with respect to the different characteristics in climate and fire regimes and highlight the finding that one single index is not optimal for all Austrian regions in both summer and spring fire seasons. In Austria, 22 ecoregions and 9 principal ecozones can be distinguished, with regard to the local climate, geology and to the forest communities that prevail due to these conditions. Within the ecoregions, seven altitudinal zones, comprising three altitudinal belts, are distinguished from phytocoenological and climatical perspectives (Kilian and Müller 1994). Table 1 provides an overview of the ecological characterisation of the ecoregions. In general, an average density of 0.03 forest fire records per square kilometer forest area is documented with a large variation over the ecoregions. The ecoregions of the eastern and southern Intermediate Alps, the Northern and Eastern Rim Alps and the warmer (in summer) East are affected the most by forest fires (Fig. 2). Historical fire data from 1993 to 2007 was used to compare the fire weather indices’ performance on fire days to their performance on non-fire days. To test the performance of selected indices, we used weather data from meteorological stations for the required period. We used the spatial context of the 22 ecoregions to choose an index for the summer season (May–November) and for the winter season (December–April) according to its ability to best predict fire occurrence. For two ecoregions (9.1 and 9.2), long-term climatic data were lacking, and they were excluded from our analysis. The climatic data were sourced if possible from stations within each region. To make up for potential lack of input variables from the stations, we used approaches which were considered feasible like calculation of intermediate variables (i.e. snow layer) The selection of weather stations was done by the meteorological experts from the Institute of Meteorology at the University of Natural Resources and Life Sciences, Vienna. The selection was based on the accordance of station data with the climatic characterisation of the Austrian ecoregions. The experts considered for this selection not only the long-term availability of meteorological variables but the location of stations and the possible microclimate conditions at these locations. (Formayer, personal communication, January 10, 2010). In total, we used 26 stations and for each of them 15 years of daily weather data (t min, t max, t mean, precipitation, humidity and wind speed). For indices that need more detailed inputs (i.e. snow cover, potential evapotranspiration or phenological data), the necessary input was provided through expert advice and data from the meteorological service of Austria, i.e. snow cover was calculated using a function of temperature lower zero and precipitation. This approach is very basic but shows adequate results for alpine conditions (cf. Trnka et al. 2010). Phenological data were extracted from long-term monitoring time series and averaged for the ecoregions (ZAMG 2012a,b,c). Required inputs and references for the 19 indices included in the data analysis are given in Table 2. The calculations of the index values were carried out in the context of the European wide project ALP FFIRS in order to allow a comparison of the results with neighbouring countries (Vacik and Gossow 2011). We used the software tool ‘FWI Calculator’ (v0.96) provided by the Swiss Federal Institute for Forest, Snow and Landscape. However, to check the validity of the results, a cross-check of the calculations was done by the methods developed by the fire research group at the BOKU (Arpaci et al. 2010). Selecting the right index for a region is not a trivial task. Several methods have been proposed to compare the performance of fire danger indices and identify the most appropriate indices for particular regions, environmental conditions or fire management objectives (Andrews et al. 2003). Regional differences in index performance may be apparent at relatively small geographical scales (Padilla and Vega-García 2011). An index has to be a good indicator showing reliable performance on fire prone days. Thus, the performance of a good index should be higher on fire days than on non-fire days. Several methods have been used to select and rank indices based on their different behaviour on fire days (Viegas et al. 1999; Andrews et al. 2003; Verbesselt et al. 2006). Non-parametric methods have been shown to be robust to differences in index value frequency distribution and thus allow more valid comparisons of fire danger indices (Eastaugh et al. 2012) than for example the C index/AUC, which has been used for similar purpose (Verbesselt et al. 2006). We therefore used an approach utilising a two-part non-parametric comparator referring to the all time performance of fire weather indices, which is described in more detail in Eastaugh et al. (2012). We subset the fire data according to the ecoregions and tested the performance of each index according to the fires that occurred within the boundaries of each region. Additionally, we included a selected set of climatic input data (temperature and relative humidity) in the comparative study to test the performance of the raw data used to estimate fire weather indices. The index value of day x is compared to the frequency distribution of all other index values on all other days (1993–2007). Every day has a percentile value according to the true value of that index on the particular day. Comparing the percentile values of different indices on fire days visually shows which indices performed better (Fig. 3).To get quantifiable measures of index performance a median based linear model is built (Komsta 2007; Akritas et al. 1995).This model has two parameters that allow for a better comparison of several indices. Slope and intercept describe the performance of an index on fire days in a way where a perfect index would have a slope of zero and an intercept of 100, as all values would be at the extreme high end of the scale on days where fires occurred. This would mean the index would have been at the hundredth percentile at every single fire occurrence. This is not a very likely situation due to the large variety of factors, which play a role starting a fire and which are not covered by climatic based fire weather index. Nevertheless, a good performing index should allow a good prediction of dangerous fire weather situations. Figure 3 demonstrates the comparison of the percentile values of four different indices on fire days. From 14 fires, the duff moisture code (DMC) and the build-up index (BUI) show all fire days with a percentile over 78, while the mean daily temperature and relative air humidity have a smaller number of high percentile values for those fire days. While air humidity had in general a lower percentile performance. The mean daily temperature showed good results, but two fires occurred on days, which had low percentile values, hence have not been as warm as the other fire days. This lowered the intercept value for temperature. This means that, in this region, the BUI is selected because its performance for overall fires >100 m2in the study period showed the best results. We made three analyses for which we used firstly all fires, fires >100 m2 and finally fires >1,000 m2. This reduction in the number of fires used in the analysis was done to clarify the relationship between fire and climate. From the Austrian fire records data base, 42 % of the fires have no recorded size. Sixteen per cent have a size <100 m2. Twenty per cent have a size >101 m2 but are <1,000 m2. Only 22 % of the fires burnt >1,000 m2. The 42 % of the fires with no information on size available are unlikely to be large fires, so the results from climate based fire danger indices might not be representative of the real fire danger. Assuming that larger fires occur only when the fuel moisture is low enough to sustain a fire, those fires probably were small fires with little relation to dryness and due to anthropogenic causes. Thus, we considered fire no information about burned area as <100 m2. It has to be considered that the suppression efficiency of the Austrian fire fighters is high due to the level of technical equipment and the high density of the forest road network. These two factors allow for a quick and efficient response to any fire alert. This means that not all small fires in the data base could be reduced to days with non-fire prone weather conditions. However, still for small fires, the likelihood of being predicted by climate based indices accurately is low, and therefore, excluding them from the analysis should yield better results. ‘Better results’ in this context means indices, which performed better than others on ‘large’ fire events, have a higher chance of being selected. Thus, the median-based model should yield higher intercepts for ‘large’ fire events compared to that for all events. For each of the ecoregions, we ran the processes described above, calculating indices and sub-setting the index percentiles on fire days. The results are tables that have the slope and intercept for each index on fire days in the region. Sorting those tables by highest intercept yielded the index, which has been giving the highest level of fire danger on fire days in that region. We did the analysis for summer and winter to account for seasonal differences. The number of first ranks for each index was calculated in order to allow an easy comparison between different seasons and regions in the resulting graphs. We performed a comparison between the indices for the summer season (May–November) and for the winter season (December–April). With the use of non-parametric techniques, we were able to detect differences between several fire weather indices. From the results, it seems clear that some indices have higher potential to be used for predicting fire weather than others, although the differences between the indices ranked first, second or third are small. Indices with the highest intercept value for each ecoregion are shown in Tables 3 (summer) and 4 (winter) for the station representing the ecoregion and using all fire records in that period and for that spatial entity. The name of the selected index and the intercept of the median-based linear model are given. The number of fires shows how many fires have been used for the analysis using all, >100 m2 and only fires >1,000 m2. The results show that in most cases the intercept increases when using larger fires, even though the available number of fires is less (Fig. 4). In most cases, the indices showing the best performance change with the number of fires used for analysis. The analysis of the indices for the summer season using all fires (n = 942) from the 26 stations shows some interesting features (Fig. 5; the mean daily temperature, the Canadian BUI, the Keetch Byram drought index and the Carrega I87 have the best performance. Temperature was selected as best performing at eight stations. The BUI was selected as the best performing model five times .The KBDI and its modification the KBDISI have been selected six times. The I87 was selected three times. Other indices were selected only once each, like the DMC, the M68, the Canadian FWI and the Drought Code (DC).The other indices were not selected at all. Using only summer fires >100 m2, the number of fires in the analysis is reduced to 397.The mean daily temperature and the BUI clearly outperformed the other indices. The BUI and temperature were selected seven times, while the other indices were selected only once, twice or not at all. For summer fires >1,000 m2, the BUI was selected at six stations, the Angström at five stations and FMI at three stations. The Fine Fuel Moisture Code (FFMC), FWI, I87 and KBDI were selected at two stations. M68, KBDISI and the Portuguese index Ifa were selected once each. However, in some ecoregions (e.g. 2.2, 5.4, 7.1 or 7.2), the results should be interpreted carefully due the small number of fire events. The differences between first ranked and second/third ranked indices are in some cases very small (not shown). This should be kept in mind while interpreting the results. Nevertheless, using a pure numeric approach gives a clear result, which might be a benefit of this method with its straight forward ranking process. Figure 6 indicates the spatial distribution of the first, second and third ranked indices for all ecoregions of Austria during the summer season using all fire records. The impression about the generally best performing indices is confirmed even, when taking into account the second and third ranked index. The BUI is selected 15 times, the KBDI/KBDISI 14 times and the DMC 10 times. Temperature is selected 11 times, whereas no spatial trend can be identified in relation to the mean annual temperature of all ecoregions. For all fires that occurred in the winter season (December–April), the M68dwd showed a high performance (Fig. 7). It was selected 14 times, and its origin, the M68, was selected four times. Selected three times were the Munger, twice the Nesterov, while the Angström, FFMC, KBDISI, EMC, humidity and DMC were selected once each. All other indices were not selected due to their poor performance. Reducing the fires to only those fires which exceeded 100 m2 indicated that the M68dwd was selected 17 times out of 25 stations. The M68 was selected three times. Munger and I87 were selected twice each and the Nesterov/Humidity once. No other indices were ranked at first rank. Using fires >1,000 m2, the M68dwd still gained the best performance (13 times selected), while the Munger was chosen four times. The I87 was selected three times, the FFMC twice and initial spread index (ISI), M68, Nesterov, humidity and Sharples once each. The results indicate that it is very important to use different indices in the summer and in the winter seasons. Indices such as the BUI and Angström, and in some regions the KBDI, are fair indicators for estimating the fire danger in the summer season. It is interesting why especially those three indices outperformed the others in the summer season as they represent different indices types. The BUI is an intermediate index required to calculate the Canadian FWI. It represents the amount of fuel, which would be available for burning when a fire occurs. Furthermore, it combines two indices that model fuel moisture in medium-sized fuels and deeper layers. It can be also used as an indicator for describing potential fire behaviour severity. The Angström index is calculated by combining temperature, humidity and expresses immediate fire danger. It does not use a model for fuel moisture nor does it accumulate the danger ratings over time. In this sense, it is a simple day-to-day fire danger indicator. The KBDI expresses soil moisture deficiency and requires other weather variables such as annual rainfall. It is often used for drought classification in agriculture management due to its strong relation to soil water availability for plants (Keetch and Byram 1968). The NFDRS of the USDA forest service is using the KBDI as part of their fire warning system (Deeming et al. 1977). Comparing the algorithms of these indices, it becomes evident that the BUI is a direct fuel moisture model, the Angström has a pure climatic approach and the KBDI is a general dryness model. Therefore, the Angström index might be good if there are rapid changes in weather situations, which increase the fire danger situation so quickly that fuel or soil moisture models are not able to capture that moment. The BUI can represent fuel moisture models, which are quite often reasonably accurate for alpine vegetation, even if the vegetation type is not the same as the vegetation where the Canadian fire weather index was developed (Van Wagner 1987). Other past and current researches try to adjust the moisture models of the Canadian FWI to increase its applicability to other forest types than the original vegetation types that it has been developed for (Wotton and Beverly 2007).The physical principals and the combination of two ‘slower’ moisture models, within the BUI index, might still be a good representation of the moisture circulation in alpine vegetation. This would explain the high success rate at indicating fire danger for alpine systems. Interestingly, the mean daily temperature was selected as best performing for some ecoregions only during the summer period, during the winter and spring season the temperature seems not be a strong predictor of fire danger. This result is in contradiction with the studies by Padilla and Vega-García (2011) who identified the maximum daily temperature as a good proxy for estimating fire danger in some regions of Spain, while Holsten et al. (2013) described the relative humidity as best performing index on a monthly basis independently from the growing season in Germany. The winter season shows two very strong results, the good performance of the M68dwd and the importance of the classification of seasonal differences. We defined the winter season from December to April, taking into account those days on which tree leaves have been shed, and the snow has already melted but no new leaves have sprouted yet. Particularly in broadleaf dominated forests, this is a situation that can lead to occurrences of severe fires due to the amount of available fuel under dry conditions (Conedera, personal communication, May 2011). In the winter season, the best index in most of the ecoregions is the M68dwd. The M68dwd is a modification of the M68 (Käse 1969) by the German weather service (Wittich 2010, written communication). The M68 is used to predict fire danger in the Scots pine stands mostly in Brandenburg (former East Germany). The M68 is based on the Nesterov index and combines precipitation, humidity, temperature and vapour pressure deficit. Additionally, the M68dwd was developed to simulate the impact of phenological stages and seasons for fire danger. The greening and sprouting dates of indicator species (European Birch—Betula pendula L., Black Locust—Robinia pseudoacacia L.) are used to include environmental characteristics, which decrease fire danger due to a higher moisture content in green vegetation. These factors allow the modelling of the fact that precipitation within the summer has a different impact than in late autumn or spring. These correction factors seem to work well if the vegetative state is related to fire danger. However, including fire events that took place in April (when a high number of the fires occurred) in the winter season analysis has a strong impact on the result. This decision is based on the assumption that, in some areas, there is still snow; other regions might be free of snow but the vegetation growth has not started. This dangerous situation with a lot of dry litter seems to be reflected well by the M68dwd. Two input parameters that are necessary for calculation of the M68/M68dwd have to be treated carefully. They are difficult to obtain and are subject to coarse assumptions. The dates of sprouting and budding are not spatially explicitly monitored. Most observations came from the ZAMG database (ZAMG 2012a) and are collected by ‘hobby botanists’. This does not necessarily mean that the data are of poor quality but that no high resolution spatial data or continuous time series were available for this study. Data used in our analysis were selected, assigned and averaged based on observations from recent years within the ecozones. This means that locations of stations and observations are not necessarily close to each other and therefore rarely represent the same micro climate. This might well be a possible source of error, which could be improved with the availability of spatially explicit information on sprouting and budding only. Additionally, the M68dwd needs a snow layer input (binary: yes/no), which is still difficult to obtain especially for highly differing topographic landscapes. Although we used a simple approach, it should still be true for alpine conditions (Trnka et al. 2010). Situations that could occur, such as forest fires when snow cover is present, are not covered by the M68dwd, but such occurrences are very rarely documented. Whenever possible, the most representative stations for each ecoregion were used. It is common for most fire agencies all over the world to use single stations to monitor weather for large landscapes and provide an estimate for fire danger (Andrews et al. 2003). However, this selection process is based mostly on expert opinion and local weather situations might vary highly in landscapes with strong topographic features. Both causes might be reasons for not covering actual fire danger where it really occurs. For some ecoregions, we used more than one station because we concluded that one station is not representative enough for this particular ecoregion. This led to situations in which different stations in the same region showed different results for the same indices on fire days, and consequently, different indices would be selected as best performing. This could lead to difficulties when deciding which index to use. The difficulty of selecting a representative meteorological station for the climatic conditions of an area of interest is a common problem in similar studies (Andrews et al. 2003, Cane et al. 2008). In Fig. 8, we demonstrate that the annual means for temperature and precipitation of the selected stations in this study tend to show the same pattern as the mean values for the total ecoregion, using all stations within this entity. As the mean annual values for the ecoregions are aggregations of stations at lower and higher areas within the ecoregion, these pattern seems reasonable. However, the absolute mean values of the selected set of stations have a higher annual mean temperature and lower annual mean rainfalls, which could indicate that fire danger estimations based on these input data tend to overestimate the real fire danger for the ecoregion. In our study, the stations have been selected by experts based on their representativeness. Nevertheless, it underlines the problem of using local point data originating from weather stations for the prediction of fire events in unknown locations. Several agencies combine different stations to find a compromise solution (Cane et al. 2008). In Austria, high resolution climate data is available (ZAMG/INCA) but not yet in a time period that would allow such an extensive long period analysis in relation to the fire records available. Furthermore, the DAYMET software is able to produce point based extrapolated weather data back to 1960 (Hasenauer et al. 2003) but was not applied in this study because variables like wind are not considered variables needed to be predicted on a daily basis as input for the calculation of some of the indices. The use of station data is still the state of the art for fire weather monitoring. Remote sensing approaches are being tested and may prove to be quite useful because they have a high spatial resolution and are not point based (García et al. 2008). Another approach is to extrapolate mixed sources climate data models like Integrated Nowcasting through Comprehensive Analysis (INCA; ZAMG 2012b,c). Fire as a stochastic process within the landscape is hard to predict by meteorological forecasts alone. The strong anthropogenic impact on ignition risk (Chuvieco et al. 2010) and the availability of a fire prone vegetation type in a steady fuel bed are necessary to quantify fire danger in a holistic approach. Nevertheless, the best holistic fire danger model will not be able to cover all situations under which a fire might occur. The random processes that might lead to ignition and to a burning fire are too complex and steered by interactions beyond the ranges of fire weather indices. It is fair to assume that there are always some fires that will not be predictable. These fires can be described as random bias for the analysis of the performance of a fire weather index. These ‘random’ fires are part of every fire database. They have a strong impact on the result as they might occur on days where the index showed no fire danger or a low fire danger. This results in a decrease in the performance on fire days for the respective fire weather index. In our analysis, the intercept of the median-based linear model (mblm) would be decreased by these fires on low fire danger. This has implication for fire management and their objectives when selecting an ‘ideal’ index for the region of interest. Using a cost–loss approach for example and alerting fire fighters on the basis of the danger level of a fire weather index has implications for financial and structural resources planning. Using an index with a high intercept and setting the alert thresholds high would mean that fire fighters are not all the time in stand-by mode, only when a given threshold is reached. The consequences could be to miss fire occurrences on days with low fire danger levels as no stand by suppression units are alerted with the emerging consequences. However, this does not play a strong role in Austria because there is as yet no direct link of level of fire danger and suppression tactics. The high number of voluntary fire fighters (>340,000) and fire brigades (>4,500) supports the quick response rate in Austria, and financial considerations in the context of a higher fire suppression budget are still not relevant. In countries with more severe fire regimes and other fire management organisation, a cost–loss approach might be considered as important, where the value of intercept and slope of the performance of a single fire weather index can help to evaluate and select an appropriate index according to fire management objectives. By reducing the size of burned area in the analysis, we increased the intercept of the mblm for most cases (Fig. 4). This means that the index performance on fire days where larger fires appeared is better. This is to be expected due to the meteorological conditions which are necessary to dry the fuel bed for a continuous spreading of a fire. However, some stations did not show this increase or showed only slight improvement when using fires greater than 100 m2 but not with fires >1,000 m2. This might be caused by either too few fires related to those stations or the fact that the stations do not give a very representative picture of the weather situation in the given region. This might be especially true when intercepts are over all three analyses lower than in the other stations. To differentiate the indices into their functional algorithms might help to understand which functional groups are better suited to predict fires under certain conditions. We could not assign a functional group to a geographical stratum. However, it seems that when looking at fires >1,000 m2, the indices (FMI, Angström) that are simple and non-accumulative are showing a better performance. This seems reasonable assuming that larger fires occur under conditions that are fire prone and clearly to link to fire danger. Under not so clear fire weather conditions, indices with a greater complexity are better able to track and predict fire danger conditions. These findings also link to the use of raw climatic data for predicting fire danger. The results of our study show that, in the summer season, the mean daily temperature is a good proxy for fire danger in seven out of 18 ecoregions. This is at first surprising considering the amount of work and studies, which went into the development of complex and very often used indices like the Canadian fire weather index. However, to a certain degree, our findings reflect that the tested indices have not been adjusted nor developed for Austrian conditions. Thus, fuel moisture might be biased by strong topography or different vegetation types/fuel beds. The selection of temperature corresponds to the results that have been presented by Padilla and Vega-García (2011) who tested fire index performance with different methods and a larger fire data set for Spain. They found maximum daily temperature outperforming other indices for some regions. Still, the operative system in Spain is based on the Canadian system because this aggregation of several climatic variables within one index can be interpreted not only with respect to ignition but also potential fire behaviour. Holsten et al. (2013) found relative humidity to be a good indicator of fire danger in Germany. This finding could not be confirmed for Austria where humidity was selected only for few stations during the winter season. It remains true that, in some cases, a more simplistic model can be very successful even in competition with very complex models. However, as many other factors (fuel characteristics, socio-economic factors) are influencing fire ignition in the Alps, it might be worth to consider indices for fire danger with larger complexity as well. We were able to select for each defined geographical strata the best working index or raw climatic variable based on historic fire events and the performance of the indices on those fire days. The selection process is straight forward and is useable under different fire regimes. The results show that it is better to use different indices for different regions and seasons. Based on the recent analysis, we are not able to assume why some indices show a better performance than others in the same region. This could mean that it is sometimes a good idea to combine indices to cover areas with a large variation in topography and local climate. However, the selection of an appropriate index should take into account fire management objectives. If they are to suppress every fire occurrence immediately with no limitations in financial and human resources for fire fighting (as in Austria), the choice of a very sensitive fire weather index, with a high intercept on all fire days, might be appropriate. This may be different in a situation where fire fighting resources are limited and not every fire can be immediately suppressed. Furthermore, it would be interesting to test the performance of station data against high resolution data and compare whether the selection of indices based on meteorological data input for the specific local conditions lead to other distribution of indices and danger level thresholds. Fire occurrence is not only related to weather parameters. Modern fire danger models try to include factors related to ignition probability according to socioeconomic factors, topographic features and the type of vegetation. Combining these parameters with the most promising fire weather index could increase the performance and assist the work of fire managers and other operational institutions. This research has been conducted partly within the frame of the AFFRI, which is funded by the Austrian Science Funds (FWF) with the reference number L539-N14, the European Project ALP FFIRS (Alpine Forest Fire Warning System), which is funded by the European Regional Development fund of the Alpine Space Program with the reference number 15-2-3-IT as well as the FIRIA (Fire Risk and Vulnerability of Austrian Forests under the Impact of Climate Change) project funded by the Austrian Climate Research Program. The authors would like to thank the colleagues from ZAMG for providing data and expert advice and Marco Conedera and Boris Pezzatti from WSL for the use of the fire calculator v0.96. All statistical calculations were done with the free software R (2012).